AnyForty launch their new Versus Volumes collection with a preview event at East London store Roktic this Thursday evening. The launch of the Versus Volumes sees the UK brand move away from traditional seasonal collection to a series of ‘chapters’ which will drop throughout the years ahead. The first of these chapters will see release at the end of this month, but before that you will be able to get a sneak peak at the designs from the new range this Thursday. Roktic will play host to a gallery of artwork by all seven artists involved in the new collection, including UK artists SPZero76, Nikki Farquaharson, UltraFry & Iain MacArthur, Americans Greg Mike & Chris B Murray, and Sprinkles from Australia. 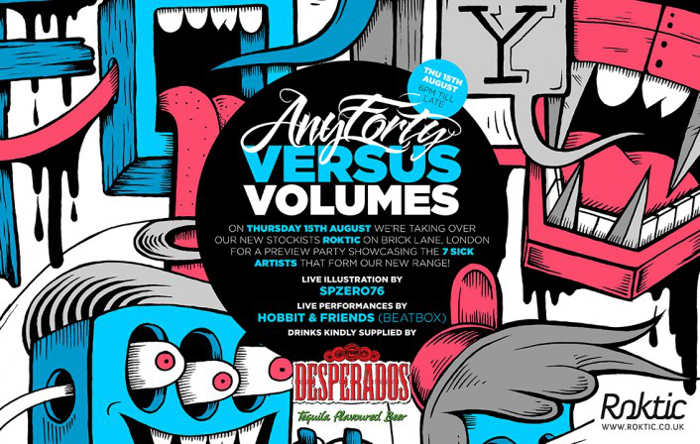 The event will also include live art from Bristol’s SPZero76 and beatbox performances from Hobbit. I’m eager to get a look at the work of the new AnyForty artists, especially those hailing form the UK, and look forward to seeing how AnyForty present the new collection. It takes place from 6pm this Thursday August 15th, more details follow below.